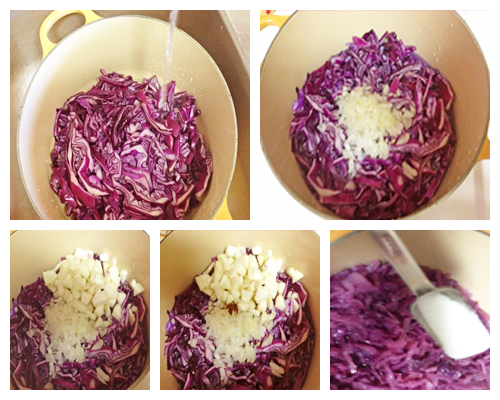 Red, Purple Cabbage: cabbage gets its color from a pigment called anthocyanin as do all red, blue, and purple plants. Red cabbage was even grown in the Middle Ages when botanists learned to encourage its special color feature. In its raw state, cabbage contains iron, calcium, and potassium. High marks are given for its vitamin C content. Cabbage is also high in vitamins B1, B2, and B3. Lengthy cooking tends to lower the nutritional value considerably. 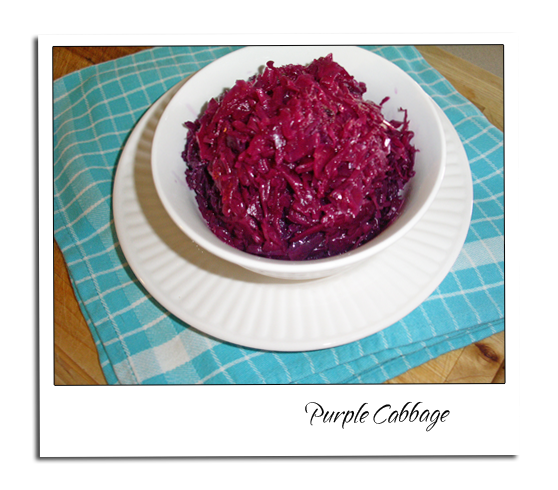 Red cabbage is higher in fiber than green, with 4 ounces of it boiled and drained offering 2.7 grams. It’s higher in vitamin C, offering 25.8 milligrams for 4 ounces cooked. Red cabbage is also higher in calcium, iron, and potassium than its green cousin. Savoy and napa cabbage can boast they contain 20% of the RDA for vitamin A, while red and green cabbages contain considerably less. Bok choy contains the most vitamin A, supplying 60% of the RDA, although it is equal to red and green cabbage in other nutrients. Pickling is an excellent way to preserve the vitamin C in cabbage. In fact, Captain Cook attributed his crew’s good health to a daily ration of sauerkraut. 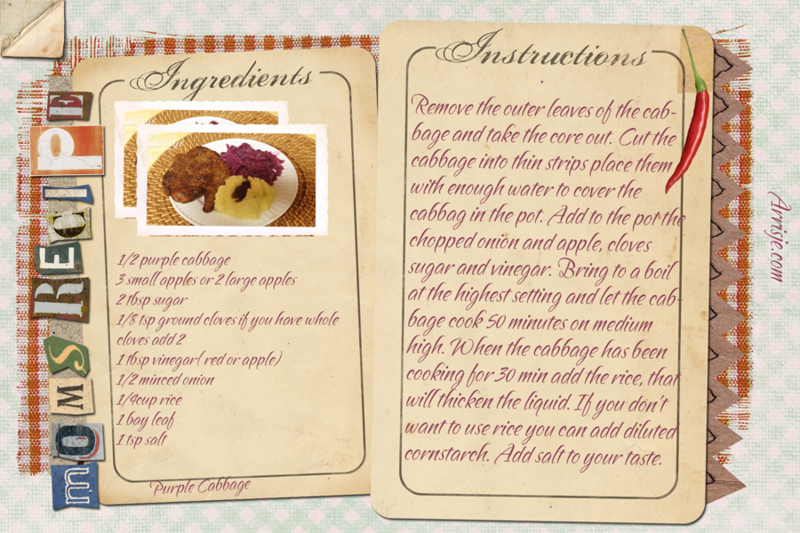 Purple Cabbage: (Rode Kool) Is another recipe of my mom, this is the kind of food I grew up with. The pictures are not doing justice to this easy recipe. 1. Remove the outer leaves of the cabbage and take the core out. Cut the cabbage into thin strips place them with enough water to cover the cabbag in the pot. Add to the pot the chopped onion and apple, cloves sugar and vinegar. Bring to a boil at the highest setting and let the cabbage cook 50 minutes on medium high. When the cabbage has been cooking for 30 min add the rice, that will thicken the liquid. If you don’t want to use rice you can add diluted cornstarch. Add salt to your taste. Remove the outer leaves of the cabbage and take the core out. Cut the cabbage into thin strips place them with enough water to cover the cabbag in the pot. Add to the pot the chopped onion and apple, cloves sugar and vinegar. Bring to a boil at the highest setting and let the cabbage cook 50 minutes on medium high. 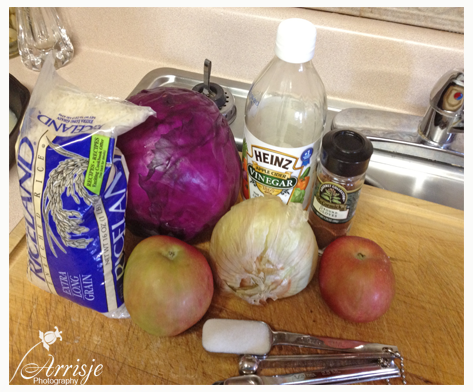 When the cabbage has been cooking for 30 min add the rice, that will thicken the liquid. If you don't want to use rice you can add diluted cornstarch. Add salt to your taste.